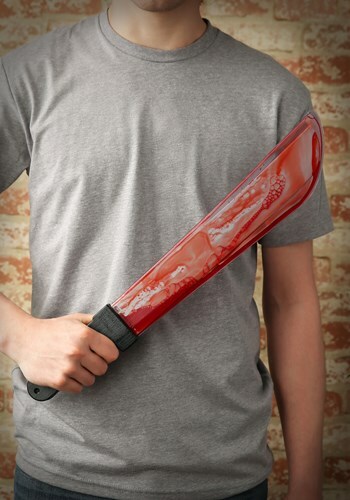 Look just like your favorite character from a horror film with this bleeding machete weapon! You, yourself can decide which unhinged character you would like to be. You can start with Alfred Hitchcock's original momma's boy and go all the way to a hockey mask wearing terror. Whoever you are going to be this accessory will be the exclamation point to your ensemble. The toy weapon measures 21" long and is made from plastic. It features a black handle and a grey blade. The grey blade is within a larger, clear blade that also contains the liquid blood that will move as you wildly gesticulate. The blood runs freely along the blade and has a realistic look. Check out all of our slasher film costumes, like Jason, Freddy Krueger and Chucky, for a complete look! Make sure you make an entrance at all your Halloween parties from now on. Your look is sure to be a scream! I'm a bit concerned about why my grandson wanted this outfit in February, but being a dutiful grandmother, I purchased it. he loves it and hasn't torn it up in a couple of weeks now. Well worth the price. love it, inexpensive, works as expected.